As the year draws to a close, it's a time to look back and reflect -- not only on the big news, but also on the bizarre. LOS ANGELES (KABC) -- As the year draws to a close, it's a time to look back and reflect-- not only on the big news, but also on the bizarre. So, without further ado, here are our picks for the top seven strangest stories of the year. A photo taken by NASA's Curiosity Rover shows rocks, but some people put their own interpretations to use. Are there iguanas on mars? How about rats, a ghostly woman or the wreckage of the Imperial Star Destroyer from Star Wars? That's what some people saw in these photos taken by NASA's Curiosity Rover. Turns out, they were just rocks and shadows - or so the government would have us believe. This Instagram photo posted by @WascoClown shows a clown posing for a photo on a bench in San Joaquin Valley. A Chicago couple caught him on their phone camera. Cemeteries in the dead of night are spooky enough without a clown standing there waving at you. He eventually ran off. This remains an unsolved mystery. Read full story. 5. All aboard the doggy train! An 80-year-old Texas man who has been taking in abandoned dogs has built a 'doggie train' to take them out to a creek once a week. Eugene Bostick of Texas took in stray dogs and built them a little train to go on adventures. The dogs love it, so did you. This story pretty much blew up our Facebook page when it first ran. Also, we're happy to report that a Gofundme campaign to help feed and care for the dogs just reached its goal of $15,000! Read full story. The owner of Wolfee Donuts in Lake Elsinore wants an apology from Ariana Grande after surveillance video allegedly caught the pop star licking and spitting on doughnuts at his shop. This incident took place at Wolfee Donuts in Lake Elsinore. Grande and her friend can be seen on surveillance video licking donuts - not donuts she bought but donuts sitting on a counter for anyone to buy. Unfortunately for Wolfee Donuts, their health grade got lowered from an A to B. Read full story. City officials released 20,000 shade balls into the Los Angeles Reservoir Monday, the final step in a $34.5 million water quality protection project. The little plastic balls, nearly 100 million of them, were dumped into the L.A. Reservoir. They save water by reducing evaporation and keep it clean by preventing algae blooms. Read full story. 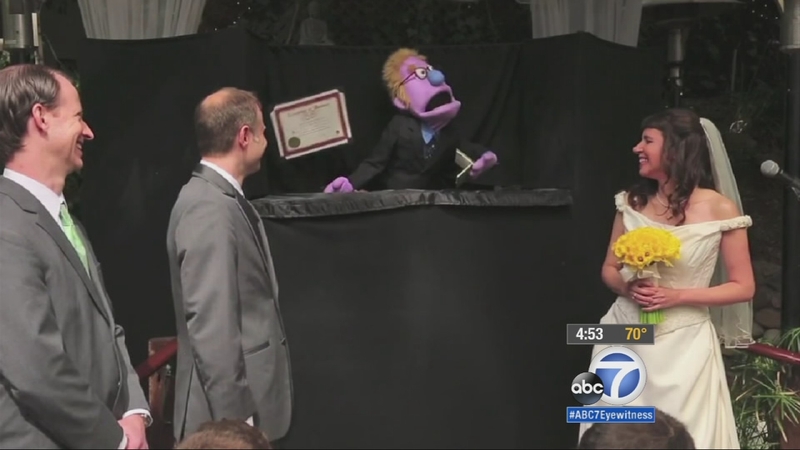 Two zany kids in love from Sherman Oaks pulled off a memorable and unique wedding: Their wedding was officiated by puppets. By the power invested in me ... as a puppet? Joe Gold and Tammy Caplan of Sherman Oaks wanted a "different" kind of wedding. So, with the help of the L.A. Puppet School, they turned the ceremony into a puppet show! Best of all, they kept it completely secret from their friends and family until the big day. Read full story. In 2012, he was just a few swing states away from the presidency. In 2015, he made No. 1 in our strangest story of the year. Mitt Romney was beaten up by Evander Holyfield. It was all for charity, and nobody got hurt. Though, Romney's famously perfect hair did get messed up a little. Read full story. If there was a strange story we missed on our list, let us know in the comments below!